There are plenty of trails nearby suitable for all fitness levels. Explore the historic town or head into the hills. 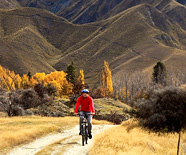 Single track, 4WD road and even ride and wine tours available. You can choose guided or self guided rides, use our bikes or bring your own! More information at Arrowtown Bike Hire. For more information visit www.arrowtown.com .